Statement of Bro. 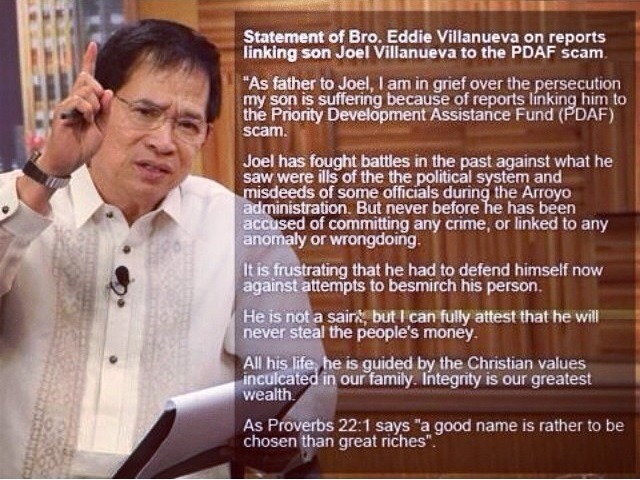 Eddie Villanueva on reports linking son Joel Villanueva to the PDAF scam. “As father to Joel, I am in grief over the persecution my son is suffering because of reports linking him to the Priority Development Assistance Development Fund (PDAF) scam. Joel has fought battles in the past against what he saw were ills of the political system and the misdeeds of some officials during the Arroyo administration. But never before he has been accused of committing any crime or linked to any anomaly or wrongdoing. It is frustrating that he had to defend himself now against attempts to besmirch his person. He is not a saint, but i can fully attest that he will never steal people’s money. All his life, he is guided by the Christian values inculcated in our family. Integrity is our greatest wealth. As Proverbs 22:1 says “a good name is rather to be chosen than great riches”.